Argentine President Mauricio Macri was sworn in Thursday, inheriting myriad economic problems from the often-divisive outgoing President Cristina Fernández de Kirchner, who skipped the inauguration in a final sign of confrontation that underscored deep polarization in the South American nation. Macri, the former mayor of Buenos Aires who hails from one of Argentina's richest families, took the oath of office in Congress in front of legislators, several Latin American heads of state and other dignitaries, including former Spanish King Juan Carlos I. "Today a dream is being achieved," said Macri as he took the oath 15 minutes ahead of schedule, surprising commentators who noted Argentina isn't known for such punctuality. The new president then launched into a speech that was both a long list of promises and a frank, if not brutal, assessment of how he saw Argentina, a country rich in natural resources that has also suffered several major economic meltdowns. Macri said the nation of 41 million people was entering the 21st century behind in its development, and that its education system needed modernized at all levels. He said that "lying about and hiding" the state of the economy had tarnished Argentina's reputation worldwide, a clear dig at the Fernandez administration, which often put out suspect figures on inflation, poverty rates and gross domestic product. "I will always be honest with you," Macri told the nation. "And being honest means telling you that the challenges in front of us are enormous." The 56-year-old ran on promises to usher in an era of more civil discourse and roll back much of the Fernández administration spending that many economists say has brought Argentina to the brink of another financial crisis. One thing standing in his way is the continued, hostile influence of Fernandez, whose party still controls the Senate and has the largest bloc in the lower house. Throughout his campaign, Macri argued that measured free-market reforms would overhaul the struggling economy. He also promised to be a leader "who listens more and talks less," a clear contrast with Fernández, who frequently blasted opponents during hours-long speeches. In his Thursday address, Macri promised to fight the nation's growing drug trade "as no president has before." He also said he would make good on his aim to achieve "zero poverty" in the country and be ruthless in cracking down on corruption. Fernández, and before her late husband and predecessor, Nestor Kirchner, dominated Argentina's political landscape for the last 12 years. The power couple sharply increased spending on social welfare programs while raising tariffs in attempts to protect local industries and aligning the country with leftist leaders like late Venezuelan President Hugo Chavez and Bolivian President Evo Morales. Macri has promised to undo many of those policies and improve relations with the United States. "Finally, the day of change has come," said Nelly Lopez, a 58-year-old waving Argentine and Venezuelan flags outside of Congress. "This (economic) model is ending, just like it is in Venezuela. Lopez, one of tens of thousands in the streets, said she and her three daughters immigrated to Argentina from Venezuela several years ago because of frustration with Chavez. The economic backdrop won't provide Macri much room for maneuver: Inflation is around 30 percent, foreign reserves are dangerously low for the third largest economy in Latin America and a long-time spat with a group of creditors in the U.S. has kept Argentina on the margins of international credit markets. Macri will be wedged in by campaign promises to lift deeply unpopular restrictions on buying U.S. dollars, and thus eliminate a booming black market that has made it difficult for local businesses to operate. The lifting of restrictions will likely lead to a sharp devaluation of the Argentine peso, a scary proposition in a country that defaulted on $100 billion in debt during a 2001-2002 financial crisis that thrust half the population into poverty. At every step, Macri will likely have to contend with Fernandez, albeit now with the power of the presidency. In her last weeks in office, Fernández rushed dozens of bills through Congress, appointed ambassadors and many other public workers and cut some taxes on the provinces, which will all make Macri's initial months more difficult. Her decision to skip Thursday's inauguration ceremony was widely criticized; it was the first time since the country's return to democracy in 1983 that an outgoing president has done so. On the surface, the tiff was about inauguration logistics. 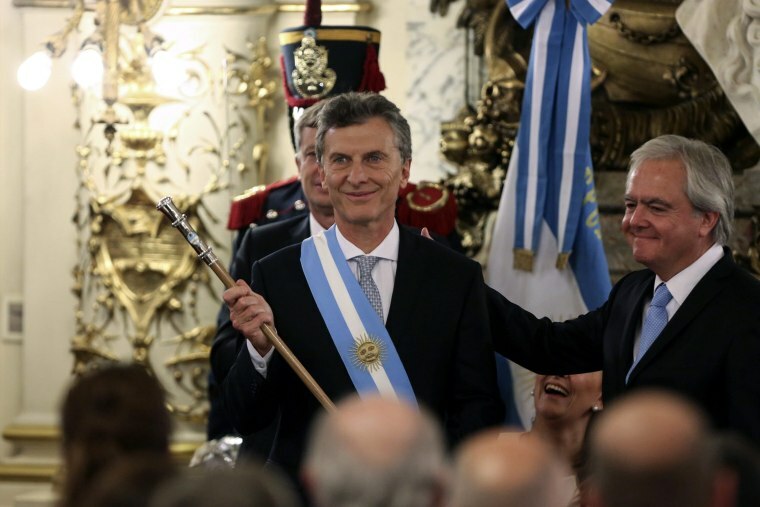 Macri wanted to receive the presidential baton and sash from Fernandez in the Casa Rosada presidential office while Fernández insisted the transfer happen in Congress. Weeks of bickering make clear the dispute it had become personal. During her going-away speech Wednesday night, Fernandez made it sound like she had been forced out as her term expired at midnight. "I can't talk much because after midnight I'll turn into a pumpkin," she joked.